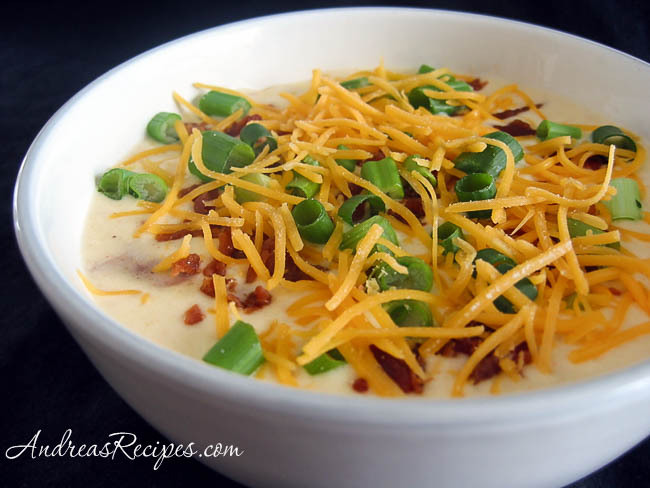 It’s cold and raining today…perfect for a hot, comforting bowl of cream of baked potato soup. I must confess that this recipe is always changing. I’ve tried for many years to perfect it, and I have found myself constantly tweaking the ingredients or preparation. But no matter how I make it, we never seem to have a problem making this soup disappear. This takes some time to prepare, but it’s time well spent. Because I have played around with this recipe so much, I’ve kept track of a number of variations that have also worked well, which I have listed below. Do you think a lower-fat milk would work? I’ve used various types of milk, including skim and evaporated skim milk. The lower the fat content in the milk, the less thick and rich the soup. So you can certainly go for a lower fat content knowing that the soup will just not have the thickness you would get with the higher fat content. I have not tried the soup with Low-Fat Blend, but it’s something you might try to see if you can get the same thickness. I get about 12 to 15 (6 to 8 fluid ounce) servings out of a batch. Wow! This looks so good, can’t wait to try your recipe! I tried your recipes but I used pre seasoned cheddar mash potatoes and a lil less milk so it was a bit thicker as well as I only used the cheese and bacon as a garnish and my family went crazy thanks for the idea on the best potatoe soup every says the kids!! So I just made this and I will admit I love how thick it is. I have yet to find a recipe for potato soup that has this kind of texture. But I was wondering if there was a way to make it more flavorful? I followed this recipe step by step and used the exact amounts and ingredients as listed above. But it just seems as though it is lacking something. Do you have any advice of something(s) I can add to it? I think we’ll be trying this recipe soon! Thank you, I’ve commented on her post. Hopefully she will remove my photo.